I like having a blog “project.” You know, something to report on every day. After the Yoga Challenge ended, I didn’t know what to report on. So I rested. I read a bunch of books about yoga, (yeah, I know, big surprise there), and then I started to work in the garden and play outside more, and before I knew it the whole delicious and beautiful month of May had been gobbled up by time. I want the trees to stay that fresh, chartreuse-y green. I want the viburnums always in bloom. When I see the first aster, the first goldenrod, the change of the sumac from yellow to red, I nosedive into despair. I have been wanting to learn my camera ever since I got it. I have had it for a few years now, and it’s a pretty nice one, but I have never really explored its capabilities outside of the “Auto” setting. So when I found this site today through The Bliss Project, I thought that this would be a way to kill the proverbial “two birds” by photographing something everyday, and then posting it here. Can I twist a few arms to join me in this cool challenge? It might be really fun, and it would give those of you who blog, a daily focus. 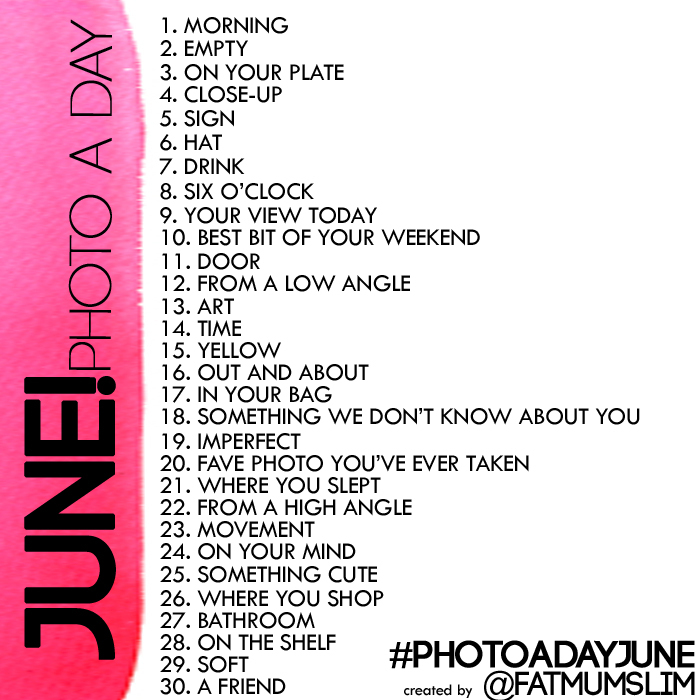 And even if you don’t blog, you could post your pics on Facebook, or hashtag #photoadayjune on Twitter. I think it would be fun to see how people I know, interpret all these prompts. I also think I am going to change themes tomorrow as well, so don’t be alarmed if things look different.